1) White vinegar is a magic potion and basically a cure-all. Salt stains on your shoes? White vinegar. Stench in your room? White vinegar. She swears by it. 2) No one washes their pillows nearly enough. Yes. You should be washing your pillows. Like, in a laundry machine. The care tag will give you specific directions for getting those fluffers nice and clean. 3) Unseasoned meat tenderizer removes blood stains. Add water to it to create a paste and then let it sit on the stain for about 30 minutes. Rinse with cold water and then wash. So weird but I'm excited to try this one out. 4) Nail polish is toxic and there's most probably no non-toxic way to remove it if it spills all over your bathroom floor. Jolie hates cats. She rivals Martha. 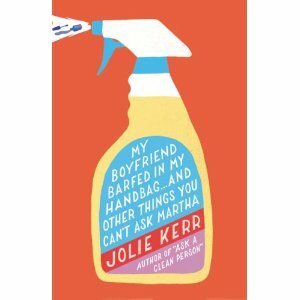 She's one of the best clean people I know so go buy her book. You won't be let down.